on January 22, 2019, 10:27 a.m. 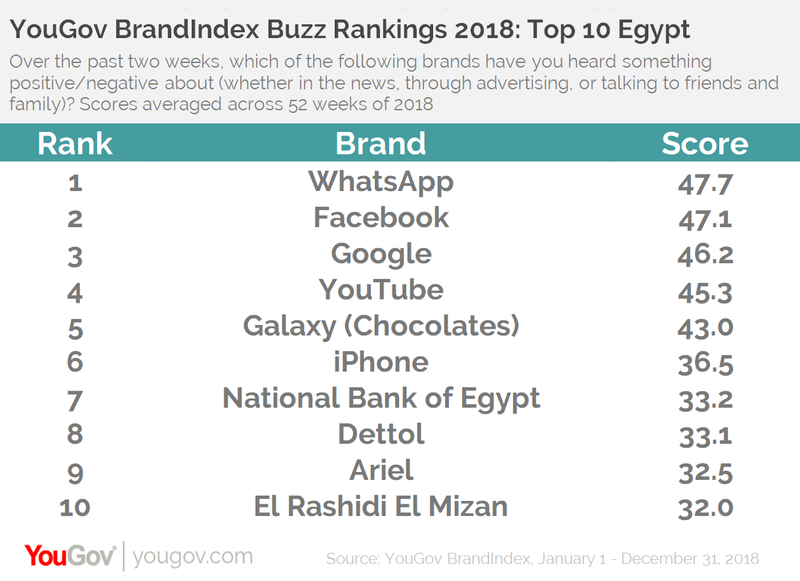 These brands have generated the most positive buzz among consumers in the UAE, Saudi Arabia and Egypt. The annual YouGov BrandIndex Buzz Rankings showcase the brands with the most positive buzz over the past year. Dubai-based airline Emirates, fast food restaurant chain Al Baik and global messaging service app WhatsApp, have been crowned as the brands generating the most positive buzz in the Middle Eastern countries - UAE, Saudi Arabia and Egypt, respectively. In the UAE, we see a surge in the popularity of the Samsung brand. While the electronic giant Samsung climbed up to second position from sixth last year, Samsung Galaxy created a lot of noise with the launch of its new phone, Samsung Galaxy Note 9, and also saw an elevation in its Buzz score, improving from tenth in the 2017 rankings to fifth in 2018. On the other hand, Samsung’s key competitors in the mobile space, Apple and its iPhone handset, retain their places in the top ten rankings, but drop from ranks four and three last year, to six and seven, respectively. 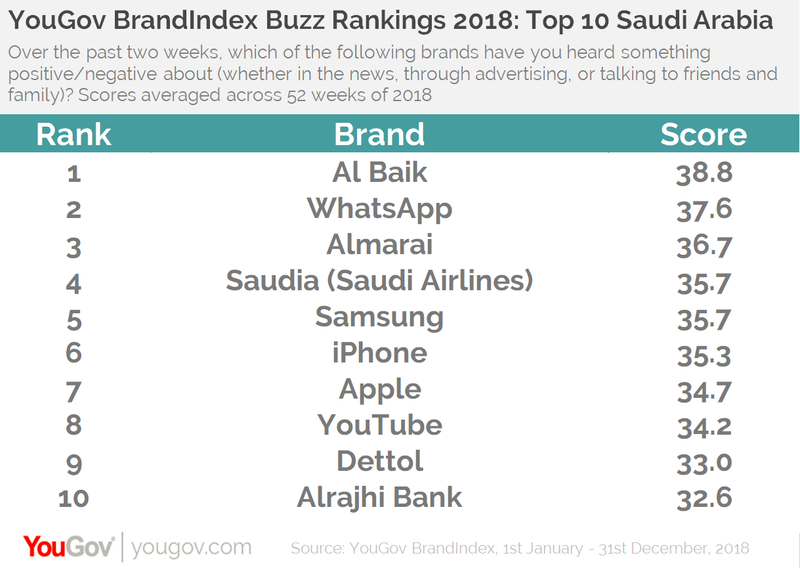 In Saudi Arabia, things didn’t look so bright for the leading mobile service and handset providers in terms of Buzz scores. While Samsung Galaxy lost its spot in the top 10 rankings, iPhone saw a drop in its rank, from third to sixth this year. 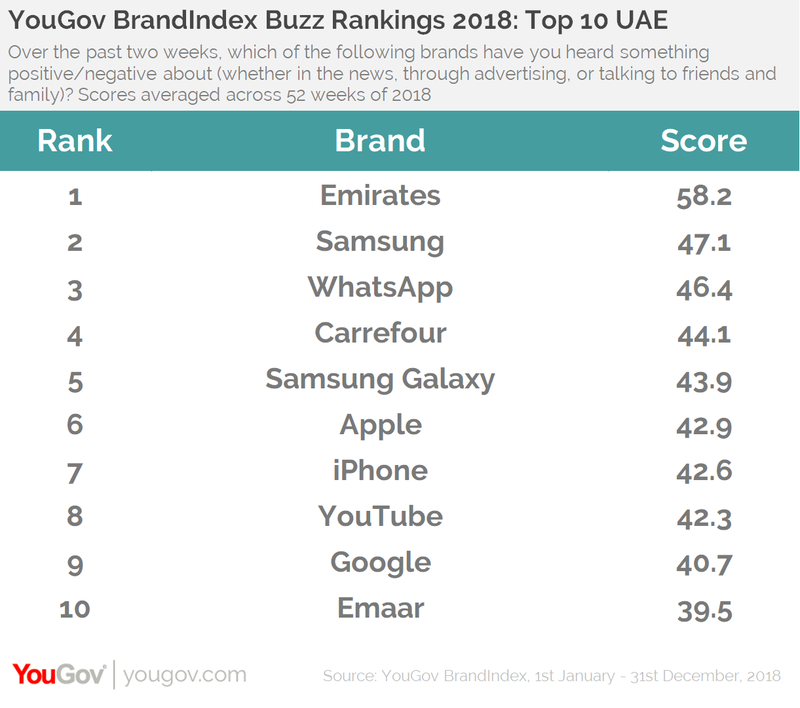 Meanwhile, Chinese tech giant Huawei has successfully struck a chord with consumers in both Saudi Arabia and the UAE and has shown great improvement in its Buzz score in the past year. In Saudi, it is the second most improved brand and in the UAE, it is the third best improver. YouGov BrandIndex has also revealed the ten “most improved” brands of 2018. In the UAE, Coca-Cola is the “most improved” brand of the past year, with a rise of +7.5 points to its Buzz score, going from +6.5 in 2017’s rankings to +14.0 in 2018’s. Heinz and mada soar to the top of the improvers list in Egypt and Saudi Arabia, respectively. 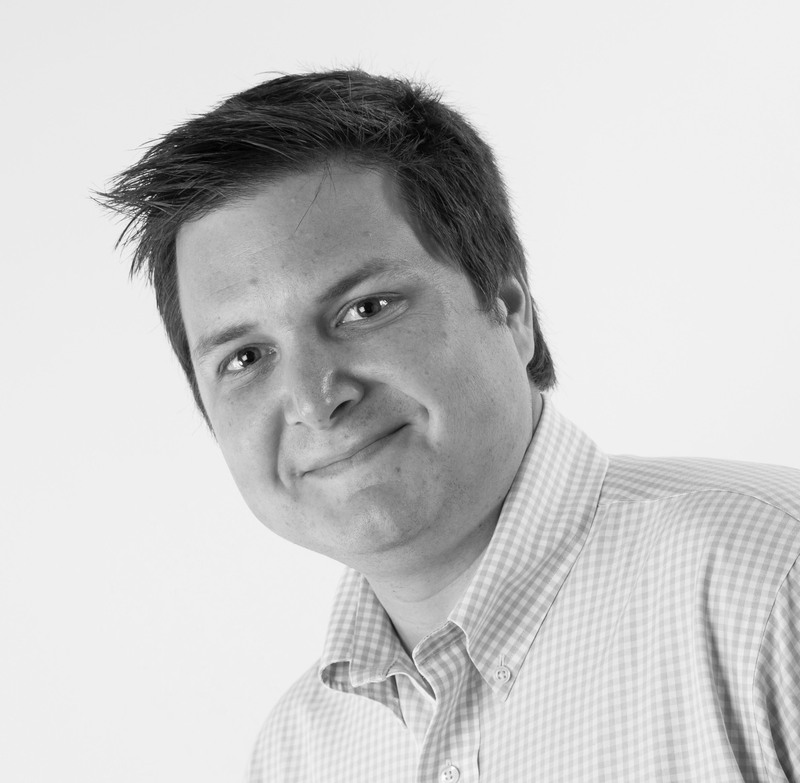 Heinz witnessed a rise of +7.4 points to its Buzz score and mada advanced its score by +8.1 points. In particular, beverage brands seem to be resonating well with consumers in Saudi, with four leading brands parking themselves in the top 10 improvers list. On the other hand, fast food chains and food brands fared well with people in Egypt. As a relative newcomer to the region, Netflix is generating positive Buzz in the UAE and Egypt, becoming the second most improved brand of the past year in these countries. The 1336 brands in YouGov BrandIndex were ranked using the Buzz score which asks respondents, “If you've heard anything about the brand in the last two weeks, through advertising, news or word of mouth, was it positive or negative?” Scores are net scores, calculated by subtracting the percentage of negative responses from the percentage of positive responses for each brand.